After 71-year-old Duane Partain fell in his garden, he stopped spending time among his plants, fearful he’d fall again. Duane, like most older adults who experience falls, thought taking time away from his usual activities would reduce his risk of falling. However, the opposite is true. The lack of physical activity that comes from not doing your usual activities often results in declines in balance and strength, making you more likely to fall. While most people who want to avoid falls, try to make their home safer, they often overlook their own bodies, which can develop balance impairments or become weak. Picking up throw rugs and installing grab bars are great places to start, notes physical therapist Lori Schrodt, but working on your balance and strength can give you the extra tools you need to avoid falls. “If you don’t have a balance impairment, you can catch yourself when you trip over a rug,” explains Schrodt. If you have a fear of falling, want to increase your strength and balance or simply want to try a new activity, consider tai chi. Tai chi is a centuries old practice that involves certain postures and gentle movements combined with breathing and mental focus. The movements can be adapted and done while standing or sitting. The National Institutes of Health says tai chi might be more effective than other forms of exercise in reducing falling and the fear of falling. In fact, a clinical trial found found those people with Parkinson’s disease who practiced tai chi had improved balance and stability over those who did resistance training or stretching. Partian credits tai chi with helping him ease his fear of falling and making him stronger. 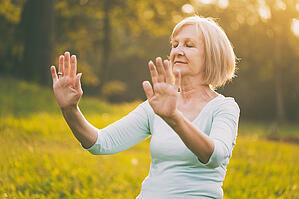 Because, he says, tai chi helps him be more aware of his body. “The fall doesn’t catch you unawares. It doesn’t just come out of the blue. You can tell what is going on, and you can be proactive to stop it,” he explained. This is a simple exercise great for beginners. These movements promote flexibility in your shoulders, fingers, and arms. Before beginning an exercise program, always check with your doctor. If you’re interested in trying tai chi, take a look at these classes in northern, central and southern Ohio.